October 9th is World Octopus Day, believe it or not. Even more unbelievable, the octopus can teach us quite a bit about the best decision strategies when it comes to hunting for bargains, as I reveal in this blog that was first published in Psychology Today in 2014. 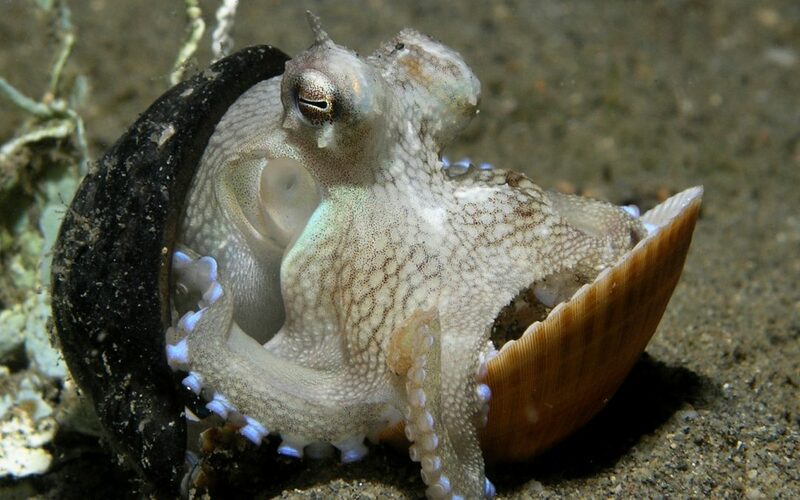 The octopus uses the shells as a portable home. According to researcher Julian Finn, the octopus prefers discarded shells that have been split symmetrically by machete-wielding humans. It does not spend a lot of time searching for the best shells, though. Once it finds one that is halfway decent, it is off and running with its prize. Modern statistics suggests that the octopus’s strategy is a good one, and can be adapted with benefit for shopping in flea markets, Internet shopping and even shopping on Ebay. It is particularly powerful in situations (such as large markets) where there may be many sellers purveying the same or similar items. It’s just a matter of getting the numbers right. The basic idea (discussed more fully in my book The Perfect Swarm) is to estimate how many samples of the item might be available in total, and then look at a limited selection of these before choosing the next one that is at least as good (in terms of price and quality) as the best of those that we have so far seen. This procedure saves time and effort, and also reduces the possibility that we will spot a bargain, keep looking for a better one, decide on the original one, and go back only to find that it has been sold! Even a typical male shopper such as myself can benefit from this procedure. Like many of my gender, I am impatient with shopping and inclined to grab the first sample that I see and get the hell out. With just a little more patience, I could keep looking until I find another example at a lower price, and then buy it and get the hell out. Already I am ahead of the game. If we are going for the very best, we should look at one-third of all those available before going on to select the next one that is as good or better than the best that we have already seen (in terms of the lowest price for the same quality). This gives us a 33% chance of finding the very best bargain, and a very high chance of finding an extremely good bargain. If we are willing to lower our standards a bit, we can do even better. If we are happy to accept a sample in the lowest 10% of prices, we need only look at 14% of the samples on offer before choosing the next one that we see which is at least as cheap as the cheapest of these. This gives us an 84% chance of settling on one among the cheapest 10%. If we are happy with a price in the lowest 25%, things get even better. We need only to look at 7% of the samples before choosing one that is at least as cheap as the cheapest we have seen. This gives you a whopping 92% chance of finding a bargain in your chosen range! These statistics suggest that octopus’s approach of grabbing the first decent shell that it sees gives it a good chance of finding a good bargain in the coconut shell department. The commonsense approach of the octopus, though, was not reflected in the approach of a mathematician friend of mine, who dared to think that the same statistical approach could be used when it came to finding a life partner. It was not an original idea – statisticians have long been fascinated by the case of Johannes Kepler, the famous astronomer who spent two years “evaluating” eleven potential brides before eventually choosing one after his first wife had sadly died of cholera in 1611. If he had followed the modern statistical approach, they point out, he would only have needed to “interview” four prospects instead of eleven, and he would have found that the fifth one on his list (the one he eventually chose) was better than any of these. My friend figured that he was likely to meet around three hundred women who would come up to his exacting standards. He waited until he had met a hundred, and then proposed marriage to the next woman who measured up (in his eyes) to those that he had already met. Unfortunately, it turned out that he didn’t measure up in her eyes. The story has a happy ending – he eventually met a very nice woman, and they are now happily married. These days, though, he confines his mathematics to the lab. Choosing a bargain is different to choosing a partner because the choice is one-way rather than two-way. The math works fine when it comes to bargains, and it can save us a lot of trouble. Once we have used it to find our bargain all we have to do is, like the octopus, to find some way to carry it home!